2013 is already starting to become a fascinating year for architecture. Construction plans are seeing some of the most influential architects complete various projects across the globe using the newest innovation in building materials. Buildings and skyscrapers are now being built as solutions to modern economic problems; urbanisation, overcrowding and pollution. Here are some of our favourites. 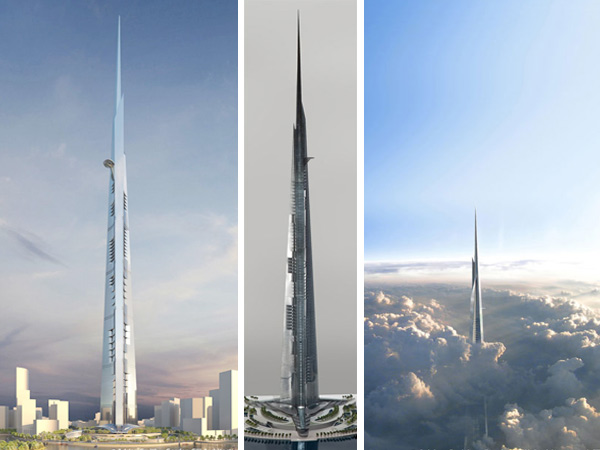 With plans revealing that the latest edition to the Saudi skyline will stand approximately 1,200 metres high, the Kingdom Tower, Jeddah will be the world’s tallest skyscraper – towering over London’s Shard (308 metres) and Dubai’s Burj Kahlifa (828 metres). Managed by the same British company who constructed the Shard, the $1.2 billion (£800,000,000) planned project will reach completion in the winter of 2018, and will start construction later this year. Covering a distance of two square miles at its base, Kingdom Tower will contain serviced apartments, luxury flats as well as office space. The large glass Kingdom city ‘centre piece’ has been commissioned by the Saudi billionaire Prince Alwaleed bin Talal and will hopefully look to boost housing for the million residents of Jeddah. 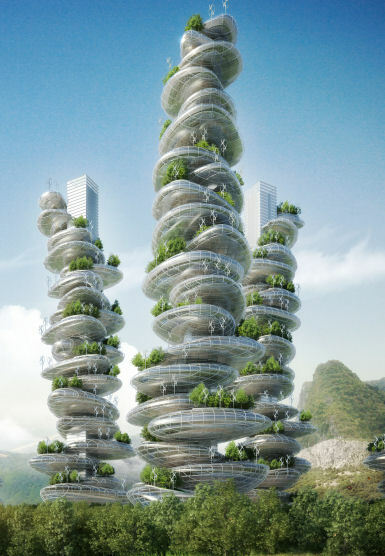 Concentrating on more than just breathtaking aesthetics, the EcoWan Project is the latest in eco-architectural innovation – a masterplan unveiled by French firm Vincent Callebaut that showcases six sustainable ‘farmscrapers’ formed by several pebble-like structures. Located in Shenzen, China, the Asian Cairns project is a distinctive urban system that has been designed in response to the growing population of Shenzen and the increase in the level of cardon dioxide (C02) emissions. 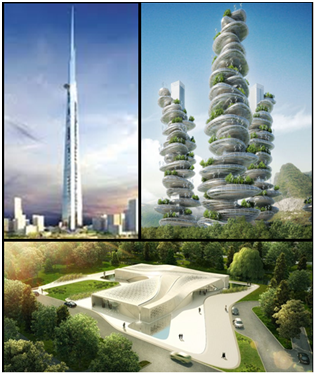 Organized on a circular site, the project will consist of six main towers, which are constructed from a stacking method that combines numerous steel rings structures on top of each other. As well as its innovative design, sustainability features heavily within the project – the inclusion of solar cells as well as wind turbines only further benefits its economic purposes by producing renewable energy. 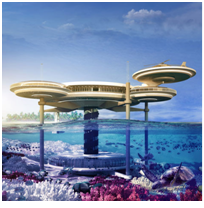 Looking at providing out of this world’s architecture, another exciting project to come in 2013 is the Water Discus Hotel, Dubai – the world's largest underwater hotel with rooms both on the seabed and on stilts above the surface. The hotel consisting of two structural glass discs, provides holiday makers with the chance to admire the depths of the ocean while making the most of the warm climate. The two parts of the structure are connected by five solid legs and a vertical shaft containing a lift and stairway. The lower glass disc, which sits on the seabed, will comprise of 21 hotel rooms with underwater views, an underwater diving centre and a bar. Each of the surrounding discs will be able to detach from the main upper disc to be used as a buoyant life raft in case of emergency or flooding. The Water Discus won't be the world's first underwater hotel – there is already one in the Maldives and another in Florida. However, it will be the world’s largest and the first to be built in Dubai. These ambitious projects are reliant on the flexibility that glass allows architects to have. Glass as a building material pushes design boundaries further, and as architects become increasingly more confident, concepts can become more radical. Continuing with the theme of conceptual architecture and intelligently manufactured building materials, please explore the benefits of our vast range of glazing solutions, here.